Some of Critical Thinking Co.'s Top Sellers - Some amazing products. (Level 2) The Balance Math™ & More! 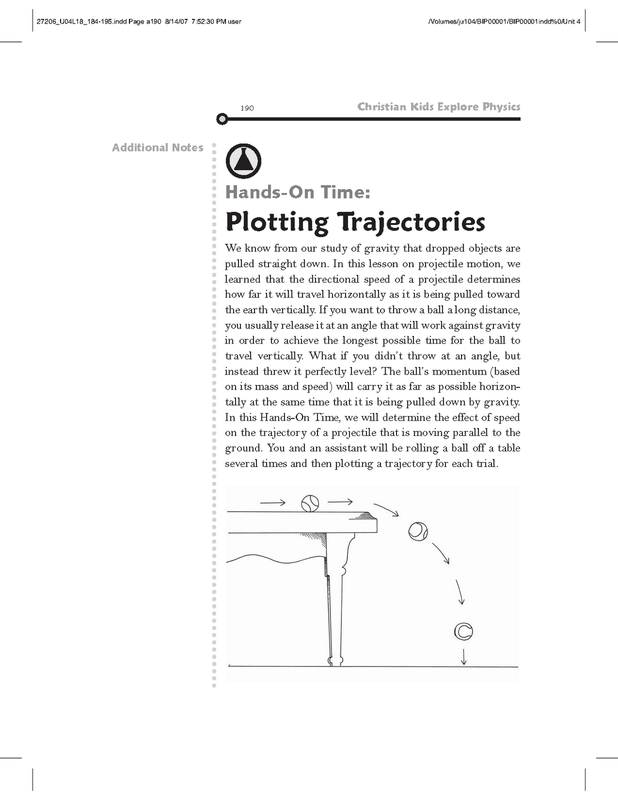 activities sharpen students' critical thinking skills, computational skills, and develop algebraic reasoning. The second book (Level 2) focuses on multiplication and division of whole numbers, but has a few problems involving fractions. The spiraling difficulty level is designed to scaffold a child's conceptual understanding of the targeted operations from beginning to advanced. Try one of these intriguing puzzles—and then try to stop! (Teaches Algebra) Understanding algebraic equations and solving algebra word problems has never been easier or more fun! This visual approach uses balance scales to teach algebra. The balance scales provide an intuitive, visual, and entertaining way to master fundamental algebraic concepts. The puzzle-like problems ensure students are cognitively involved while they hone their techniques of simplifying, substituting, and writing proofs to solve simultaneous equations. Balance Math™ Teaches Algebra is designed to move from simple to complex, with lessons scaffolding on earlier learning. And like all the Balance Math™ and More! books, these problems involve critical thinking and computation. To students, these problems are more like puzzles, with just enough challenge to forget they are doing math! I absolutely love The Critical Thinking Co. We have used several products from this company and I have loved every single one. I highly recommend this company's books. So, when I saw their company come up for review, I definitely wanted to be a part of it. And thankfully, I was chosen to review a great new concept in math workbooks. I am using Level 2 with my 4th grader and Algebra with my 7th grader. They have been working their way through the books for several weeks now. The concept is simple. So simple in fact, that it actually works. Keeping in mind that in an algebraic equation, both sides must remain equal. That is where the visualization comes in. Balance Math uses a scale as you can see in the examples above. The scale starts out equal, so it is your job to keep it equal. If you multiply by 2 on the left side of the scale, you must also multiply by 2 on the right side. If you take away a circle on the right, you must take away a circle on the left. Speaking of circles, that is another neat concept. The workbooks use shapes, along with the standard algebraic letters (such as x, y, and z). Sometimes when a child is new to the concept of algebra, seeing "x - y = 2z" can just make their head spin. Something about mixing letters of the alphabet in with computations just doesn't make sense. That is why the shapes are helpful. I can visualize taking away 1 circle from 3 circles, way better than I can visualize taking 1 "X" away from 3 "X". As I mentioned, I am using Balance Math & More Level 2 with my 4th grader. This is her first introduction to algebraic equations. She is finding it a bit overwhelming and is having a hard time understanding the concept. But I am fine with that because I know she is just in 4th grade. So I have decided to continue on through the book, working side by side with her. She is getting a great introduction into algebra and some wonderful practice in critical thinking. It isn't overwhelming to her since we are working on it as a team. And in a few years, when she is re-introduced to algebra, it won't seem so new and foreign to her. Just maybe, this will all click then and it will be much easier then because of her hard work now. As I also mentioned above, I am using Balance Math Teaches Algebra with my 7th grade daughter. She has been working on pre-algebra in her studies this year. So this book was a good fit for her. I worked closely with her the first few days to help her get a feel for the new program. Now she works independently on it, only having to come to me on occasion when she has a question about a problem. She, being older, gets the concept much better than my 10 year old daughter. I think this book has helped her a lot, not only with gaining a better understanding of algebraic equations and the all important rule that the equation must stay equal . . . but also with her critical thinking skills. I have a feeling that both of my daughters, as well as myself, have made quite a few new synapse connections in our brains the past several weeks. Check out some more reviews about this product! Other Science and Math DVDs are available. Learn fundamental principles of science through Amazing Science Experiments! You'll learn about electricity, magnetism, heat, temperature, pressure, surface tension, buoyancy, and much more. For every demonstration, a complete materials list is given, and each experiment features multiple camera views so you can see exactly what happens. Most importantly, every concept is explained in a step-by-step fashion. You'll not only be amazed - you'll understand the science behind every experiment! Ever wish your science lessons had more hands-on activities? Ever read the experiments in the book and feel lost as to how to proceed? Or you get ready to do an experiment and realize that you don't have all the supplies on hand? Or maybe you go through all the steps just to have the experiment fail? 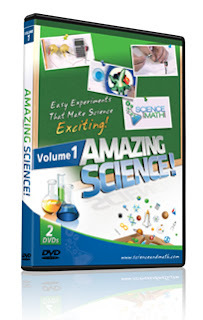 Amazing Science DVDs to the rescue. It is a set of 2 DVDs with a total of 23 experiments. Your host is Jason Gibson. He will walk you through the experiments step-by-step, showing how to perform the experiment, what to expect, and why it happens. Mr. Gibson has earned advanced degrees in Engineering and Physics and worked as a Rocket Scientist for NASA. He appears very qualified and knowledgeable in the science arena. He has a good screen presence, very down-to-earth, sensible, easy to listen to and to understand. I don't say this lightly. We have reviewed DVDs in the past, in which the speaker was unpleasant to listen to. It was a distraction which took away from the lessons. The experiments we have watched have been simple enough for my 4th grader to understand and easy enough for us to perform in our own home. One of my favorites that we have watched so far is the lemon-powered calculator. Super cool! I think this is an invaluable tool at a great price. It is your own portable science lab teacher, at a fraction of the cost. 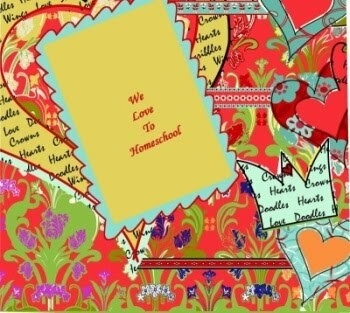 Lots of other great homeschool curricula are available. The universe that we live in is the result of God’s thoughtful design and careful building. Physics gives us a glimpse into the materials, laws, and structures of that universe. Behold the wonders of creation with this series of 30 easy-to-understand lessons for grades 4-8. Each lesson helps develop an understanding of matter and energy and the rules they follow. Exploring physics is an exciting adventure! The subject we struggle to find a good fit with is Science. Math - we have found some companies we like. Language Arts - we have found some companies we love. History - the library is full of resources. Science - this is where we struggle. From what I have heard, this is where many families struggle. So many of the textbooks we have tried have been so dry and boring. So many of the documentaries state old-earth and evolution not just as theory, but as un-debatable fact. I respectfully disagree with this opinion. And I haven't been as successful pulling living books into this subject as I have been with History. So, when Science curricula comes up on the TOS Crew Reviews, I usually try to jump on board. I keep hoping to find a good fit. 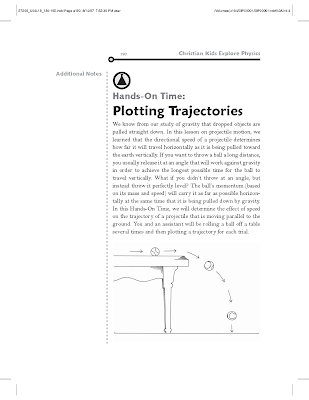 I was glad to see my name come out on the list for Christian Kids Explore Physics. Upon first glance, I liked the set up. And several weeks into it, I still like the layout and flow of it. The lessons are a nice length. Each is set up with the same basic format. I like that each lesson has an activity at the end. They are simple and easy to set up. Sometimes it is a word find. Sometimes it involves a small research topic. And other times, it is a simple experiment such as weighing and measuring. 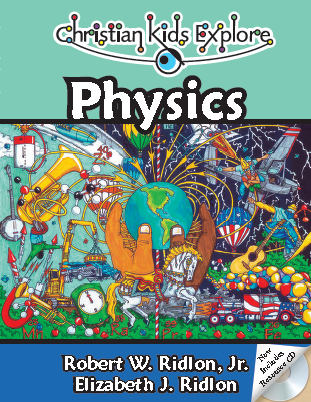 This book makes Physics a do-able topic for lower grade levels, whereas it is usually thought of as a high school level course. It starts at the very basic levels of matter and atoms and works its way up. I would say that my 7th grader understands it better than my 4th grader. But I'm okay with that. My 4th grader is still learning and touching on some higher level topics and when the topics are re-introduced to her in a few years, it will already be a little familiar. The activities are right on level for both my daughters, from looking up characteristics of elements to word searches of key vocabulary words. 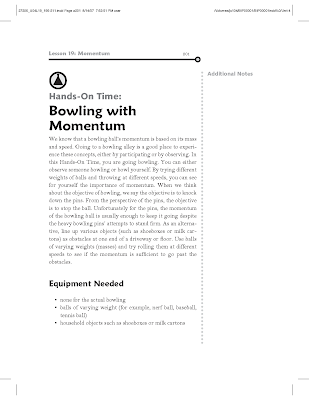 The resource CD includes the Student Activity Book, so you can print out the required pages. It also has a supply list for upcoming experiments and a lesson plan schedule, based on 2 days a week for 30 weeks. 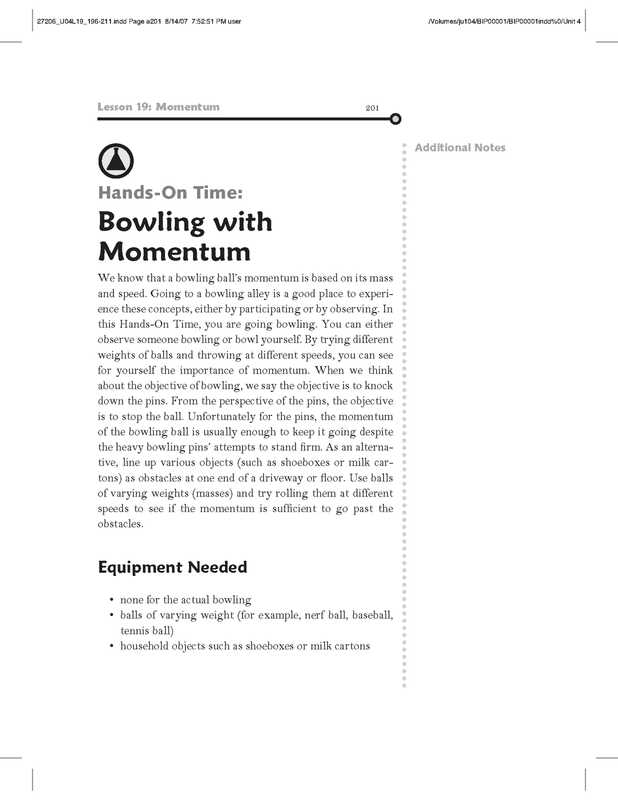 It is a nice addition to the curriculum, and it is nice that it is included with the book for free. I like the curriculum and plan to keep using it with both of my daughters.